Is Your Love Big Enough? is an extraordinary achievement on its own merits made all the more remarkable coming from a young artist recording her debut. It feels like an aural tour through a museum where the listener is the tourist and Lianne LaHavas is our charming guide. Where some tour guides become jaded to wonders surrounding them, she is eager to welcome us to them. She navigates us through the experiences of these songs with sophistication and wide-eyed wonder. It’s as if she’s reliving pages of her own diary and discovering them for the first time. She sings as if she’s awakening to a whole new world of love and art and heart is yearning to expand, racing to experience and touch and feel it all and it’s an irresistable joy to hear her feel and grow. Perhaps no song on Love illustrates her wizened youth better than Age. It’s a deliciously witty song wherein she has a conversation with herself about the rules of love, who which ones to follow, and which ones to break. Many songwriters have told their story using snapshots and films as metaphors and LaHavas uses that common conceit to extraordinary effect on the album’s finest track, "Au Cinéma." She steps outside herself to sketch scene after scene, creating a classy, noirish vignette. It's a fresh approach to an old idea, made fresh by LaHavas' lyrical and vocal presentation as well as the arrangement. "Forget" is another absolute winner in the form of an anthemic kissoff with a tinger of anger and attitude. it has a strong hook and layered vocals that give a hint of modern pop construction but without the bombast. "Lost & Found" is a painful confession of unflinching honesty. "Elusive" and "No Room For Doubt" are also high points. The sound of the record is a singer/songwriter, organic, spacious approach to R&B where most of the sounds are created by live instruments. 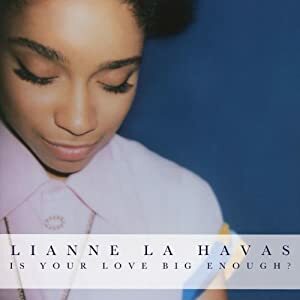 LaHavas connects vocally with nuance and lovely phrasing, allowing the natural beauty of her voice to convey just the right emotion for the moment. Is Your Love Big Enough? is the sound of a star being born and achieving flight. It’s more than just one of the year’s best debuts, it’s an essential listen that rates among the finest records of 2012. Catch this rising star; she amazes here and the best may be yet to come.